﻿ NoobPool Review | Interested in mining ether with high yield? A very interesting mining pool is in front of us. If you’re looking to mine Ether or maybe even Ether Classic, this could very well be the perfect place for you. Why? Well, because of lots of reasons. It’s pretty hard to fit the answer into one single sentence since there are so many very interesting and fairly unique features this pool has to offer. That’s why our team of crypto experts was dispatched to test everything and then report back with fresh data. 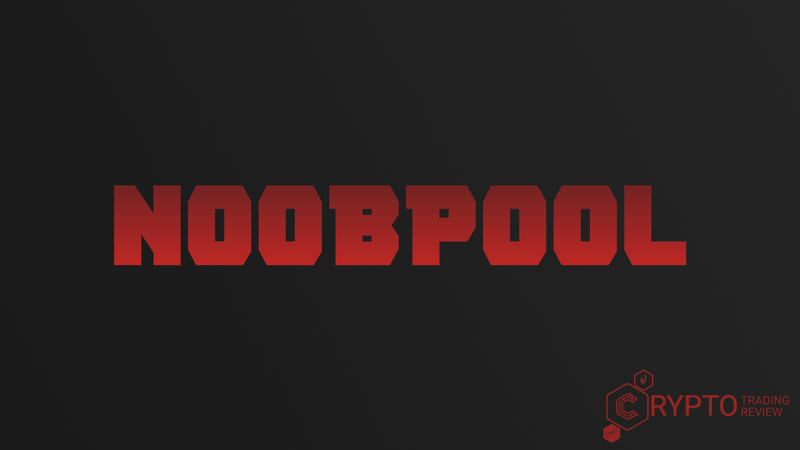 Thanks to their efforts, this NoobPool review is a first-hand account of what you can expect when you sign in here. Let’s get started, and you will see why this fact is so important. Read on, there is plenty to talk about. So, like we said at the beginning, NoobPool is a mining pool dedicated to ETH mining and ETC mining alone. It has been around for little less than a year, and there are no other supported coins to choose from – the aforementioned two are what you get. Now, because we are talking about Ethereum and its fork here, you will have to have your ethminer (Claymore is also recommended by the pool) installation complete which you will then point towards the address specified on the pool’s website. A part of it is the address of a wallet you want your payments delivered to, but you can also mine straight to an exchange you’re trading on. Bittrex is a good example of that. We must also say that it is explicitly stated on the website that CPU mining is not advisable, but we’re sure most of you will be using GPUs for it by now. Of course, Dagger Hashimoto is running the show around here. Another thing which is interesting to note is that this pool has its servers located in the United States, which is probably why it’s going with its current financial model. We will talk about that more in the next part of our NoobPool review, so don’t go away! What do we need to say about NoobPool fees? Well, a couple of things. First of all, you will probably notice when you get to the website that there are no pool fees you need to worry about. That’s a pretty significant advantage. On the flip side, all transaction fees will be kept by the pool. This is done so that all costs of running this website can be covered. Therefore, you will have to decide for yourself which part of the NoobPool fee policy is more important to you. Another thing that could play a big role in your decision is the payment system. NoobPool payment system is proportional, so the rewards will be distributed according to how much shares each miner finds. It should be said that the payments are processed every ten minutes at minimum 0.05 ETH. What is particularly important to emphasize is the website’s transparency. You can very easily check the payments here by clicking on the tab in the upper section of the screen, and the same goes for miners and pool blocks. As a matter of fact, these three tabs provide you with all the statistics you need. Payments provide you with a way to check out the last transactions made, while the Pool Blocks tab contains things like the uncle rate, orphan rate, how long it takes for a block to mature, how big the reward was for each block and what was their variance. But this is only the first part of the information we could dig up on this pool. Stay tuned, more is coming up. What are the numbers like? In this part of the NoobPool review, we will take a look at the general numbers you can expect when mining here. First of all, you will want to know that the network difficulty is about 3.3 P (at the moment of writing this article, obviously). NoobPool hash rate varied quite a bit while we were there, from 26 GH to more than 50 GH, while the network hash rate usually stands at approximately 230 TH. There are some other interesting numbers you can see as soon as you get to the main page of the website, like blockchain height, the time when the last block was found and current round variance. We already mentioned that there are no NoobPool fees, but it’s interesting to note that we would usually see a little more than 200 miners present whenever we’d come here. So, the community is very much there. And, as far as the numbers are concerned, that’s pretty much it. This is all pretty standard, nothing too fancy, but the design is functional and transparent, so you will easily find your way around here. Interested in giving this pool a shot? The next part of our analysis will show you how you can get started here. Just keep reading! Becoming a miner on this website is actually quite easy. Three steps are all you need to start looking for that magical block. You simply need to choose the wallet you’re going to be using, download the mining software (like we said earlier, Ethminer and Claymore are recommended here) and then open its command prompt to insert a line of code provided by NoobPool. Very simple and very quick. Remember, you can link everything up to an exchange you’re using, which gives you additional utility options. On top of that, once you create your account, you can always check your stats by entering your address into the search box on the website’s main page. Also, the pool is very serious when it comes to hoppers, which will not be tolerated, especially if they use bots to make their moves. If all of this sounds a bit too complicated for you, don’t worry. The links you need for each step are provided on the website itself, plus there are very detailed instructions you can use. As a matter of fact, the instructions are just a part of the excellent support here. Learn all about it in the next part of this NoobPool review. OK, so setting things up is supported by various links through which everything explained, but you can get much more help than that. There’s a detailed Help page, plus you can always send an e-mail with a question you may have. However, after that NoobPool support gets pretty interesting. You see, the pool has its own Youtube channel with some helpful tips and instructions, but there are also loads of entertaining videos there, so the whole approach is quite laid back. But that’s not all. NoobPool also has a Telegram channel with almost 400 members in the group. The community is pretty lively, so you can always expect someone to be there to help you. It’s a very nice and helpful touch. You can even get in touch with NoobPool’s founder via one of the forums he is active on and maybe ask him something or get some advice. He is very much willing to help, plus when you see how active he has been, you will never worry about the pool’s legitimacy. The reason why we dedicated one full paragraph our NoobPool review to NoobPool support is the fact that it is praised pretty much across the board. No matter which comment or review you look at, no matter what they say, this will always be highlighted as one of the main advantages. New miners will surely appreciate this, as they can set things up pretty easily and with expert help. With that, we think we have covered pretty much everything that needed to be said, but before we go, here’s a quick recap of the whole article. NoobPool is a very interesting Ethereum (and Ethereum Classic) mining pool whose main feature is that there you can mine there completely free of charge. However, while the pool fee is indeed set to 0%, the transaction fees will be kept by the pool, which is certainly something to consider. Apart from the fees, though, the most notable feature of how things are done here has to be NoobPool support. Not only is everything explained thoroughly, but you can also visit their Telegram group and get help from a vibrant community. You’ll find a lot of experts willing to help you there. In addition to that, it should also be mentioned that the minimum amount at which payments can be processed is 0.05 ETH. We should also say that it’s not recommended that you use CPUs when mining in this pool. Simply, they are not very efficient machines anymore for this particular activity. With that, we think our NoobPool review has covered pretty much everything that needed to be said about this mining pool. If you’re looking for a place where you can mine Ethereum in peace, this could very well be exactly what you need. Join them now!